Flower-heads - Like smaller daisies, about 1 in. broad; 10 to 18 white, notched, neutral ray florets around a convex or conical yellow disk, whose florets are fertile, containing both stamens and pistil, their tubular corollas 5-cleft. Stem: Smooth, much branched, 1 to 2 ft. high, leafy, with unpleasant odor and acrid taste. Leaves: Very finely dissected into slender segments. Preferred Habitat - Roadsides, dry waste land, sandy fields. Flowering Season - June - November. Distribution - Throughout North America, except in circumpolar regions. "Naturalized from Europe, and widely distributed as a weed in Asia, Africa, and Australasia" (Britton and Brown's "Flora"). Little wonder the camomile encompasses the earth, for it imitates the triumphant daisy, putting into practice those business methods of the modern department store, by which the composite horde have become the most successful strugglers for survival. The unpleasant odor given forth by this bushy little plant repels bees and other highly organized insects; not so flies, which, far from objecting to a fetid smell, are rather attracted by it. They visit the camomile in such numbers as to be the chief fertilizers. As the development of bloom proceeds toward the centre, the disk becomes conical, to present the newly opened florets, where a fly alighting on it must receive pollen, to be transferred as he crawls and flies to another head. After fertilization the white rays droop. Dog, used as a prefix by several of the plant's folk names, implies contempt for its worthlessness. 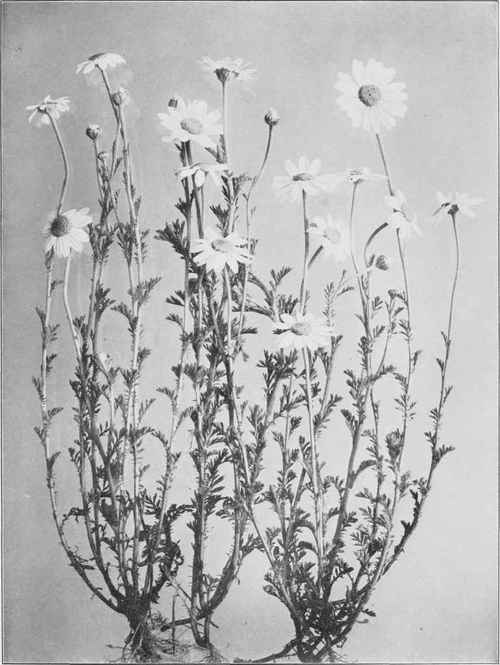 It is quite another species, the Garden Camomile (A. nobilis), which furnishes the apothecary with those flowers which, when steeped into a bitter aromatic tea, have been supposed for generations to make a superior tonic and blood purifier.